4 years later and I felt this recipe needed a little face lift. It was admitedly a little dense. A few tweaks to the liquid volume and addition of arrowroot have lightened it up quite a bit. The glaze is so good, almost caramel-y. But I’ve been enjoying them with a little cultured butter and they are equally awesome that way. 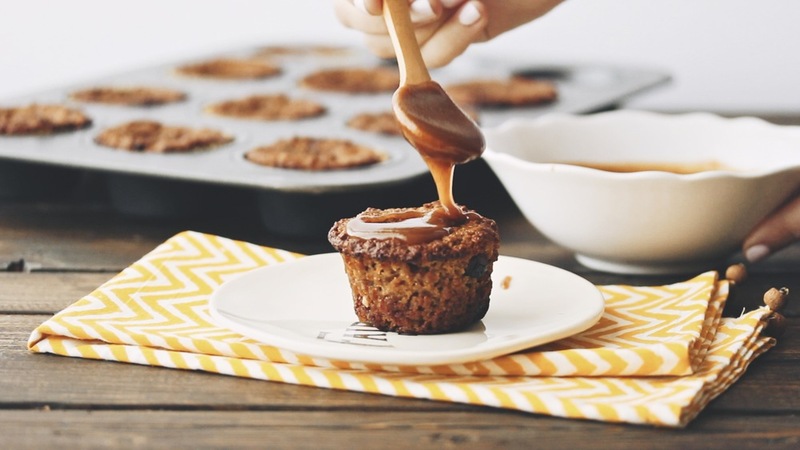 A hefty 1/4 cup molasses sounds like a lot but it really makes these muffins what they are. Preheat oven to 350F. Line a 12-muffin pan with muffin cups. Grease lightly. Add the egg, maple syrup, molasses, melted butter, apple cider vinegar, vanilla extract, and orange zest to the bowl of a stand mixer. Mix on medium speed until smooth. In a separate bowl, whisk together the almond flour, arrowroot starch, cinnamon, pumpkin pie spice, baking powder, baking soda, and chopped cranberries. Add the dry ingredients to the wet in two batches, mixing very well in between. The batter should be smooth and thick. Divide batter between the 12 muffin cups with a large disher, filling the cups 2/3 full. Bake 24-28 minutes or a toothpick inserted in the center comes out clean. Allow muffins to cool in the pan for 5 minutes before removing to a cooling rack. Cool significantly before glazing. Combine ingredients in a small bowl and whisk well. Add hot water to adjust to desired consistency. Spread over muffins while the glaze it still warm. It will set up as it cools and become difficult to spread. These were fabulous…the first baking recipe using almond flour I’ve tried that turned out perfectly. Thank you! Emily, thank you for the feedback! I’m so glad they turned out for you.